It’s no secret that running a track program at 9,000 feet has its challenges, especially this year. 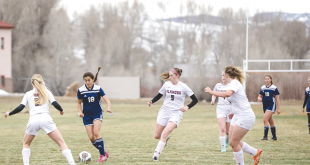 The Crested Butte Titans track season started two weeks ago with a variety of workouts in an effort to get the team ready for its first meet of the season. The first challenge actually came last year when head coach Bill Quiggle stepped down from his position, leaving the program in the hands of Sarah Fuld. Erica Black moved up from the middle school track program to join Fuld at the high school level this year. The next challenge for Fuld came during pre-season, when several tracksters were still busy with the basketball post-season. “A lot of the basketball kids have barely run a week,” says Fuld. Every year the track team endures random storms during the early weeks of the season, but this year conditions have been unprecedented due to the massive amounts of snow, coupled with the typical spring storm cycle. In addition to running, Fuld has a number of other goals in mind as she prepares the team for the season. 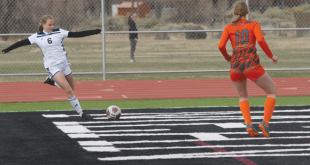 Fuld, Black and the team rose above the issues at hand to rally 14 athletes to the first meet of the season, the Mickey Dunn Invitational in Grand Junction on Saturday, March 22. The girls’ team finished the day in 11th place out of 17 teams led by senior Emma Coburn. Coburn picked up where she left off last year with a second-place finish in the 1,600-meter run with a time of 5.31.22, fast enough to pre-qualify her for the state meet. Coburn tacked on a third-place finish in the 800-meter with a time of 2.26.53 and a fifth-place finish in the 400-meter dash with a time of 64.11. While Coburn’s results scored a majority of points for the team, Fuld saw a strong effort from the other runners as well, starting with junior Mackenzie Mailly. “Mackenzie is healthy, and if she stays healthy, she’ll be a powerhouse for the team,” says Fuld. Fuld also sees freshman Erin Kelley as another solid performer this year. Kelley made a name for herself in the fall, running cross-country but needs practice on the track to get dialed in. The girls’ relay teams are just a few workouts away from making themselves known as well. The boys’ team continues to be a work in progress from year to year as interest in the sport grows through the ranks. Junior Jack Linehan opened his second season on the team with a solid showing in Grand Junction in the 400-meter dash as well as his first attempt at the 1,600-meter run. Linehan posted a time of 56.02 in the 400-meter and should be a contender for the state meet as time progresses. “He should be able to qualify for states with a little more work,” says Fuld. Fuld turned to several athletes to try a variety of other events, and they accepted the challenge without hesitation. The season is now in full swing and Fuld hopes to add more athletes into the fold. “We’re still totally up in the air,” says Fuld. In the meantime, the Titans look to fit as much training and meets as possible into the next 10 weeks, with their sights set on the state meet. The Titans track team heads to Cedaredge on Saturday, March 29 for their second meet of the season.